Not many brides have the time or even realize during their wedding planning that they may need to make a decision on what to do with their engagement ring! It is a question that comes up a lot on the wedding day as brides realize they’re unsure of what to do with their ring right before they walk down the aisle! Luckily, it’s not a big deal and you have lots of options. If you’re wondering where your ring should go during the ceremony, keep reading! Wear it on your ring finger as usual! Your spouse will put your wedding band on over (above) your engagement ring during the ceremony. Once you exit your ceremony, simply flip the rings so that your wedding band is on the bottom. This is the most common and most simple option. You can wear your ring on a different finger and place it back over your wedding band after the ceremony. 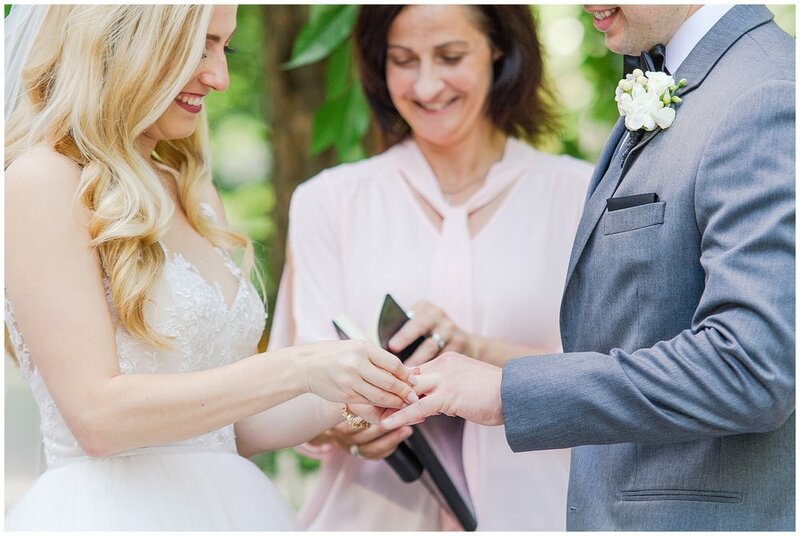 Some brides choose to wear it on their right hand ring finger for the ceremony however, that requires it to comfortably fit on another finger! If you so choose, you can simply not wear your engagement ring at all during your ceremony. Your mom could hold on to it, it could be stored in a safe place like your bridal suite, your maid or matron of honor could tuck it into her clutch or wear it on her right hand, or your wedding planner/coordinator could keep it safe during the ceremony. Some religious ceremonies will dictate that the bride is not permitted to wear the ring during the ceremony which is when this would come in to play. Regardless of what you choose to do with your ring during the ceremony, of course I always recommend a special, heirloom quality box to store your ring like THIS ONE or THIS ONE. It’s a special space for your ring to be stored and photographed that showcases and protects your most precious possession!